Growing up in a well drilling business in Maine, Ted Dyer realized early there was a good living in well drilling and water. The family business, started in 1904 by his grandfather, was a well drilling operation in Maine. As a young adult, Ted moved to Minnesota and joined an exploration drilling firm, a job that included much travel through the western U.S. In 1982, Ted returned to the Northeast, and joined his brother Ronald who had a well drilling company in New Hampshire. Ted opened the first Dyco Water to complement the drilling business, and supplied pumps and water treatment for the drilling customers. As with many of us, in 1990 Ted decided warmer climates were more to his liking and moved to the Sarasota area. The Florida version of Dyco Water soon followed and has been growing ever since. One of the earliest additions was Terri, the “pretty lady in the apartment upstairs” who eventually became Mrs. Dyer and the controller/office manager/bill collector for the business. One of the plans for growth included getting additional certifications to open more options and opportunities. In 1993 Ted earned a State Water Well Contractors license, and in 1996 a State Water Plant Operator’s license. These certifications have allowed the company to diversify into additional lines of business. Not to stop there, in 2005 Dyco acquired O’Connor Environmental Water Treatment and in 2006 purchased Mermaid Water Treatment. These acquisitions broadened both his public water plant customer and residential customer bases. Also in 2006, they built a new building and consolidated the Dyco/Mermaid Water Businesses. The new building was built with an additional tenant warehouse, so they are now also in the landlord business. As you can see, despite the economical downturn, the Dyer business operations are growing in Sarasota. The family also includes four children, Katie, Scott, Chris, and Michael. Scott is currently working as a salesman and installer for the business. The year 2009 continues to bring exciting changes to our continued growth. 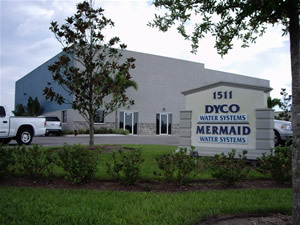 In April 2009, DYCO acquired Discount Waterworks of Venice. Lastly in August 2009 DYCO started our new internet-based business, which allows our customers who wish to do their own repairs, the ability to purchase and have any product needed to be shipped directly to them. Currently we ship to all 50 states, Canada and several locations in Europe.